At the turn of the 20th century Art Nouveau was system of aesthetics that encompassed painting, drawing, sculpture, architecture, jewelry design, furniture design, etc. It was a global (western) movement that incorporated an ideal of the abstract flow of the lines and patterns of nature into a disciplined functional design. It was a marriage of beauty and use, and as such formed the basis of Modernism. And, as is always the case, the term Modernism echoed the precepts of Classicism. Art Nouveau expressed itself completely in the Art Nouveau Medal. Most of the great Art Nouveau sculptors, painters and designers were also Medallists. The form and substance of the medal was one of ultimate Use: They were created on round or rectangular planchets to celebrate specific occasions and accomplishments in identifiable metals all the while celebrating the artists' vision of natural beauty. Two world wars and a global depression gave rise to a total rejection of classical (Read: Modern) ideas of the marriage of "technique, beauty, and form and use." The rejection of Modernism gave rise to Post Modernism wherein the "The concept" was championed in "fine art," most often by those with minimal conceptual training, while form, use and beauty were consigned to "decorative arts." At the same time, I will note the same movement occurred gradually in the conception of Money, which progressed from the naturally useful function of precious metal towards the realm of pure concept. Fifty years later, the championing of Concept - in art by those who by now have no conceptual training whatsoever - and in Money by those who have no practical training in use - has coalesced into an unintentional Theater of the Absurd wherein "Fine Art" is dominated by advertising executives and commodity traders, while Money is conjured into existence by academic theorists. Not coincidentally Art Nouveau medals have been trading readily and plentifully for little more than the (degraded) price of the precious metals in which they were created. But as we are clearly in the endgame of the Conceptual Absurdity, and the pendulum is swinging back towards ideal of natural use in money, the value of "use, function and beauty" in art is sure to follow. M. Felix Galipaux: famed actor, playwrite and star of five of the original films of Georges Melie. It was this very prize that catapulted Galipaux from the Comedie Francaise to becoming director of the Theater of the Palais Royal. 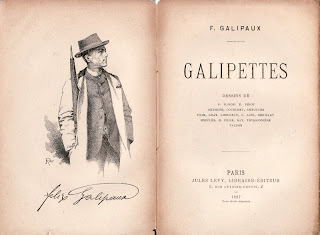 Galipaux was the Parisien Heartthrob of his era. He was a celebrated actor, director, playwrite, wit, and all around charming man about town. And like modern celebrities he had his own clothing and perfume lines. 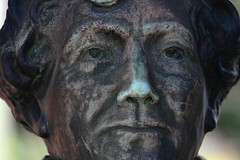 He ended up with with his own statue (pictured above).. His plays are still in print and available today. This medal would have been the period's equivalent of the Tony Award/Academy Award. International Exposition and Olympic Games, Paris 1900, Silver Medal, Capped head of Marianne right, an oak tree behind provides a wreath, rev winged Fame flies left, a Genius seated upon her holding a torch, Named on tablet: W SIMS: for innovative designs of Steam Engines. (Gad 4; MeF 81). The Olympic Games were held jointly with and seen to be a part of all that the Exposition encompassed. Signed by J.C. CHAPLAIN in a design used exclusively at the Paris exposition of 1900. In 1885, Omer Julien Dewavrin was the Mayor of Calais, who selected and commissioned Auguste Rodin to do the landmark series of sculptures "The Burghers of Calais" which commemorated the bravery of six wealthy citizens of Calais who volunteered to be executed in order that the rest of the town be spared by Edward III during the 100 years war. The commission was a landmark for both the department of Pas-de-Calais and for young Auguste Rodin who had been passed over in his three previous attempts to secure a public commission. Signed by W Kluge 1885 - Wilhelm Kluge was a medallist working in the studio of J.C. Chaplain at this time and the Marianne on the obverse bears remarkable silimilarity to those of Chaplain. a major art critic and proponent of the Arts Nouveau movement at the turn of the century, and the first Director of France's National College of Applied Arts. Silver Medal signed by Louis Bottee, awarded to the Minister and Senator MM Bernard, of the Comite Francais des expositions a L'etranger. Minted for the expostion in Lieges Belgium. MM Bernard gained international fame for his Malthusian campaign to rectify the dwindling French birth rate. St Cecil Music Contest Award, first prize 55 mm (66gm) Edge marked argent. Inscribed to Jean Champeil, who was later a soloist at the Paris Opera and early recording artist. His mono album of Bach Sonatas recently sold on ebay for $1600. Societe Central Des Architechtes Grand Prize to Louis Henri Georges Scelliers de Gisors: architecht in chief at the time for the Palais De Luxembourg, and later for Exposition Universelle of 1900. 70mm (150gm) signed by Eugene Oudine. Obv; Tyche holds the three graces, inscription "the beautiful, the true, the useful." This has been France's higheset Architectural Award from 1848 down to the present day. National School of Decorative Arts, 2nd grade prize in sculpture, awarded to: Nestor Bestault. Societe Nationale Des Architectes de France, Silver Award Medal to Emmanuel Solonier. Silver Art Nouveau Marianne equestrian medal L'EPERON (spur) 1911 Signed by the artist Alexandre Morlon (born in Macon/France, 1878-1951) Obv: Gallia in a Gaulish helmet advances with drawn sword and shield. Rev: an oak tree and a tablet engraved, Edge: state minted silver 1 cornucopia, in its original box. 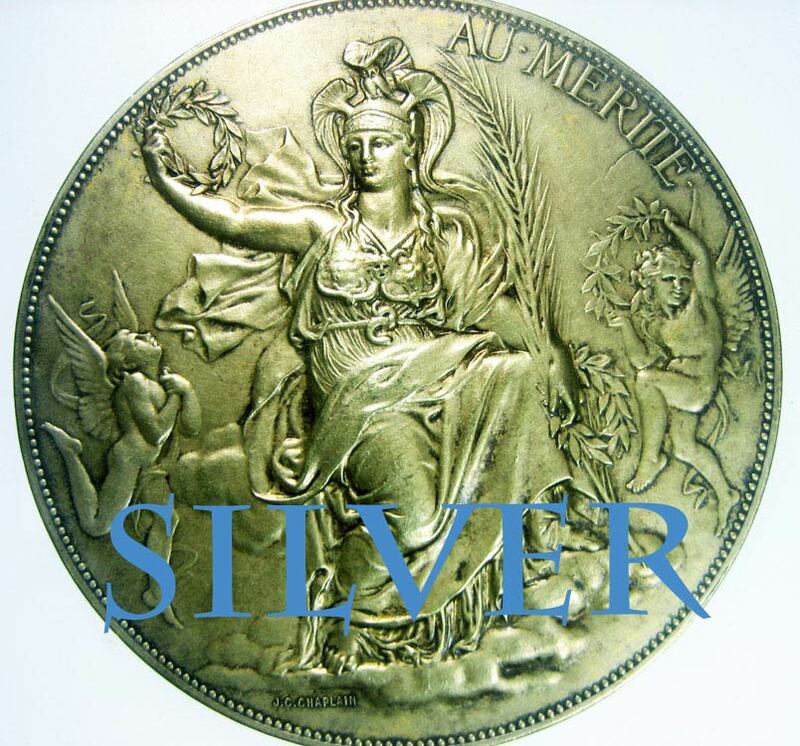 Silver Medal signed by Oscar Roty (91.3gm) for the Universal Exposition of 1889 awarded for the Concourse de Musique Pittoresque. Obv Marianne, Rev: Ministere de Commerce De L'industrie and Des Colonies.Universal Exposition of 1889, Concourse de Musique Pittoresque. A juillet 1889. Silver Merit Award from the Association of stenographers to Mme Branellec, Marcelle. Merit Award, Patriotic Society of Indre-et-Loire, signed by Roty and Desaide. Art Medal signed by George Dupre, son of Augustin Dupre (of libertas Americana fame). "When everything changes for you, nature remains the same. It's the same sun that rises on all your days."